What's the role of colo in the era of Multicloud and Hybrid IT? The year is 2010. Cloud adoption is growing by leaps and bounds. Soon, everything will be in the cloud, and why wouldn’t it be? But here in 2019, we know now that the narrative has shifted a bit. Our recent survey, The State of IT Infrastructure Management, only proves that the story is a little more complex than 100 percent cloud: Among organizations moving some of their on-prem infrastructure off-prem within the next three years, nearly four in 10 plan to move to a colocation environment. It’s true that both public and private cloud also stand to gain much from the majority of enterprises (56 percent) shifting their environments off-prem in the near future. But even in the age of the cloud, the fact is that many organizations are making colo an integral part of their IT infrastructure strategies. In this post, I’ll unpack what’s behind the shift off-prem and how colocating in a modern data center is a smart, effective way to meet the needs of enterprise IT organizations in 2019. What’s Behind the Move Off-Prem? It’s important to first understand why organizations are making the decision to move away from their on-prem data centers in the first place. Quite the list! Let’s go through them one-by-one. With N+1 redundancy and SLA-backed uptime guarantees, Tier 3-design data centers are a clear step up from on-premise data centers. To achieve the same level of power and cooling redundancy on-prem would require significant investment of both time and budget, not to mention maintaining the facilities. But there’s one other issue with on-prem infrastructure: It’s as vulnerable as your office is. For this reason, colo data centers are often located in geographic locations that are not prone to natural disasters. (Think Phoenix, Arizona, for example.) Colo has the additional benefit of being perfect for a second site, as well, whether for backups or disaster recovery. As we covered in a recent blog, security is and will continue to be top-of-mind for IT professionals. With an ever-evolving threat and compliance landscape, many enterprises find it difficult to keep up. Consider the immediate physical security benefits of hosting or colocating in a state-of-the-art data center, including round-the-clock personnel and multiple layers of access checkpoints before anyone gets close to a cage. By moving their workloads into colocation, organizations can completely offload many of the physical and perimeter security concerns of protecting their data to a trusted service provider, responsibilities that would otherwise fall on in-house teams. And if you need physical access to your hardware, colocation is the only option you have aside from being in your own data center. If you have unique maintenance or data governance requirements, colocation gives you a level of autonomy that doesn’t exist in multitenant environments, whether public cloud or anything else. Colocation allows you to take advantage of the mix of carriers that your colo service partner provides, not to mention the enhanced connectivity that plugging into their network backbone enables. Fiber rings create multiple points of egress, preventing any single point of failure for service uptime. But for applications that require ultralow latency, interconnectivity and bandwidth aren’t enough alone. While the cloud -- particularly public cloud -- is known for its ability to quickly and efficiently scale to meet application requirements, colo providers can also help any organization account for resource needs and plan for growth accordingly. Furthermore, high-density colo environments fit large deployments into smaller footprints. But high power density must be designed for and specially accommodated with fine-tuned power and cooling systems, making high density challenging to achieve for any on-prem data center. Deployments that require custom hardware are another great use case for colocation. Take gaming as an example: Some of the most innovative companies in the space are leveraging cutting-edge hardware not often available with cloud and managed hosting providers. To solve this, companies like cloud gaming service Blade (an INAP customer) seek large footprints of colocation space they can power their customers’ hardware with, paying special attention to how they expect to grow. They are able to use the hardware that best suits their business while leveraging our data center and low latency network to do the rest. Many IT leaders I speak with often say they are only utilizing a fraction of their legacy data center space. This means they have unnecessary overhead they could be allocating to more productive uses. Colocating with a multitenant data center provider takes advantage of economies of scale. Enterprises can lease space and power that is rightsized for today and then add as they see growth, receiving guidance and expertise from their colo provider along the way. Furthermore, some data center providers allow for service portability if needs change: moving from colocation to private cloud, for example. This provides a level of cost risk mitigation should changes in strategy take place. But the greater ROI on dollars invested in colocating -- when compared to maintaining and operating an on-prem data center -- is clear when you consider the sheer number of tasks and routine work that you can offload to your colo service provider. In our survey, we found that these are the kinds of tasks taking up valuable time that could be spent on innovation. The math is simple: Dollars spent on colocation return more compared to on-prem infrastructure, even if your costs stay flat. I hope by now it’s clear how modern, state-of-the-art data centers perfectly match the main reasons IT infrastructure is moving off-prem. But this isn’t the story of how colo is better than cloud or anything of the sort. As "outsourced" (aka, not on-prem) IT becomes the best way for IT departments and organizations to meet the demands of digital transformation, they would be remiss to not consider the ways in which colo is a strong, logical option, even in the age of the cloud. Resiliency, availability, security, network performance, scalability, cost: Colo can deliver in all of these areas, especially with the help of a trusted service provider to lend you their resources and expertise. TJ Waldorf leads INAP’s marketing operations as Vice President of Global Marketing. 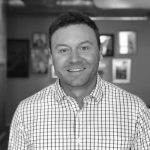 Prior to this position, he served as Vice President of Inside Sales and Marketing at SingleHop, which was acquired by INAP.